Once again a protected ecological zone on the hillside surrounding Zihuatanejo Bay is being deforested in order to clear space for new land thieves to build their shacks and begin the long wait to receive titles to this land from corrupt politicians and bureaucrats seeking their votes and kickbacks. 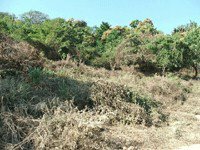 Approximately 30,000 square meters (3 hectares) of ecological reserve in the high part of Colonia Vicente Guerrero, next to another area of squatters known as Colonia Buenos Aires, has been cleared over a period of at least the past four weeks during the weekends, according to people living in this area. It turns out that the police have known about this since "three or four weeks ago", yet the clearing continues. It only made news because it was finally reported by the local fire department to the city's Ecology Department, whose inspector allegedly visited the area for the first time this past Monday, November 28. It is noteworthy that this latest invasion is occurring immediately after the local cabildo (sort of a town council appointed by the mayor) voted to approve the recent regularización of the majority of existing illegal settlements in order to deliver on a campaign promise made by the mayor, whose term expires tomorrow. When the mayor entered office he promised he would give land titles to the existing squatters and that he would not remove any since he "did not put them there" but that he would "not allow one more squatter". No, he allowed thousands more! Their population doubled during the mayor's three year term from 24 to 42 colonias irregulares. And most certainly his party got their votes as well as kickbacks to his administration's functionaries from the payments the squatters make to the "leaders" of their colonias. This practice is an old problem in Mexico and especially here in the state of Guerrero where Acapulco is the prime example of this type of political corruption and its consequences. What is most disheartening is that there is apparently no public official who will halt the deforestation or stop the squatters. They claim they will try to persuade them not to damage the ecological reserve, but the damage is already done! It is also noteworthy that even though all the political parties have had a hand at fomenting land invasions, only one local city administration, that of Jorge Allec of the PRI, has actually removed an entire settlement of squatters, who later returned just after he left office. In the three years of the self-described ecologically friendly "partido del cambio" of the PRD under Amador Campos, not only have the squatters had their way at deforesting and occupying our formerly protected ecological zones, but his administration also allowed the megaprojects of Cerro del Vigía (a very shady land swindle) and Puerto Mio (another shady operator) to blast and destroy the hillsides that form the two arms of land that embrace our bay's oceanside entrance. Many local functionaries also have lands in or abutting these new developments, including the outgoing Regidora de Ecología. All of this unplanned and unsustainable growth has caused very notable damage to the quality of the bay water as well as overtaxing our already insufficient and inadequate city services such as sewage and potable water and garbage collection. The rain runoff from the squatters communities now causes outbreaks of diseases and infections both from the dust it leaves in the streets as well as the contamination of the bay, and swimmers are reporting an alarming increase in ear infections as well. I fear a serious decline of Zihuatanejo's tourist industry will soon begin after this season as the consequences of irresponsible actions by our politicians and city administrators take their toll on tourists who refuse to swim in our polluted waters, and who will no longer enjoy Zihuatanejo's natural beauty that has now been destroyed by the ecocide, land invasions and corruption permitted by our "responsible authorities." Posted by ZihuaRob at 9:55 a.m.